First responder or first aider. If you could be involved in a multi casualty incident, consider using the Cruciform® Emergency Documentation System. First aid training is vital to all who wish to help victims of incidents, regardless of size. From the simplest bruise/scratch to a broken limb or full resuscitation, the first aider needs to be trained to cope with whatever he/she is faced with. Whether this is an accident at work or at another location, anyone providing first aid at work for an industrial accident, first aid in schools or at a sporting event, a good written record of what was done is as vital as a well stocked first aid kit and such a document should be part of every practitioner’s first aid equipment. To assist with both first responder training and record keeping (an increasingly vital addition to victim treatment), deploy the Firstaidform©. This document does not take the place of the Accident Book (a legal requirement for any work place accident), but it allows the first responder to provide an accident report which is comprehensive whilst training responders in best practice. This simple accident report form allows first aid trainers to remind trainees the information they need to record and will assist in teaching a systematic approach to victim evaluation and treatment. This will be of value to both new trainees and to those who are being refreshed/retrained in new techniques or skills. See Usage Guidelines. The multi part form allows the first aid practitioner to keep a copy of what they have diagnosed and treated, give a copy to their employer, to the ambulance service (if involved) and a copy for the victim to give to his/her doctor. The record may not be needed on that day but may prove invaluable subsequently, when the victim or relatives allege that the first aid practitioner did not do what was needed on the day of the incident. Without contemporaneous records, such an allegation is difficult to refute. 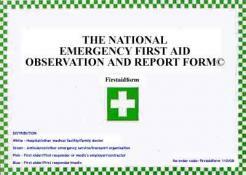 By using the Firstaidform© on the day, the first aid practitioner and their employer is safeguarded. See Firstaidform© Litigation Advice. All relevant first aid providers/organisations have a record of observations and treatments given. Legal challenges can be professionally managed. Audit trails can be established with unique reference number. Ten casualties can be recorded on one pad. Assess the scene as normal practice, to establish the priorities, with the prerequisite of maintaining your own personal safety. Having taken whatever steps are necessary to safeguard your personal safety and that of the casualty, undertake immediate care of the casualty including, if necessary, resuscitation. Having stabilised the casualty's condition, document the actions taken and injuries/illness found, using this National Emergency First Aid Observation and Report Form©. The form should be filled in, or boxes ticked, starting in the top left corner and working towards the bottom right. Ensure you get a name and address/telephone number of the casualty and other relevant administrative information, if possible. 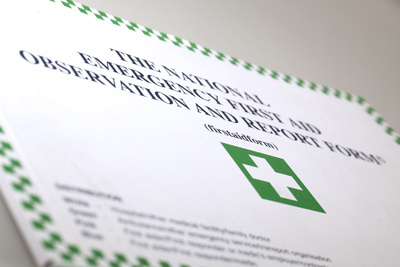 You should be aware that the National Emergency First Aid Observation and Report Form© is a document that can be used at a number of first aid or paramedic/medical levels and that others, with more training and experience, could add to and/or use the information at a later stage. Organise transport for the casualty to the appropriate medical services. If you are accompanying the casualty, assist in monitoring the casualty's condition and documenting any changes found or treatment given en route. If the casualty makes their own way by car or other private means, or if he/she refuses help, give the casualty the top and green copies of the form and advise them to see their own family doctor. If you are not accompanying the casualty, advise the ambulance driver or paramedic of the National Emergency First Aid Observation and Report Form© you are sending with the casualty so that he/she is aware it exists and that information is contained in it. The top copy of the form is to be given to the hospital / family doctor / medical facility staff and the green copy kept by the paramedic / ambulance service. Keep the blue copy for your own records and give the pink copy to your employer, or those who have asked you to undertake first aid duties on that day.